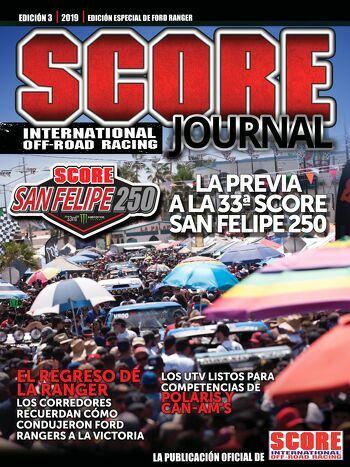 ENSENADA, Mexico—SCORE International’s SCORE World Desert Championship will continue to have a major presence at the upcoming 19th annual Lucas Oil Off-Road Expo at the Fairplex, in Pomona, Calif.
To be held Saturday, Sept. 29 and Sunday, Sept. 30, the extensive and colorful SCORE Baja 1000 exhibit area in Building 5 will once again offer desert-racing fans the opportunity to interact with the top desert racing teams in the world while viewing the most radical motorsports vehicles ever developed. The world’s most iconic, oldest, prestigious and longest continuously held desert race, this year’s SCORE Baja 1000 will be held starting in Ensenada, Baja California, Mexico. Dates for the race and race week festivities will be Nov. 14 through Nov. 18. The race is annually the finale of the four-race SCORE World Desert Championship, held exclusively for the past three years in Baja California. Among the legends, past and present, scheduled to appear at the SCORE Baja 1000 ‘Racing Into History’ book-signing sessions are SCORE owners Roger and Elise Norman, legendary Ivan ‘Ironman’ Stewart and current racers Larry Roeseler, B.J. Baldwin, Rob MacCachren, Andy McMillin, Dan McMillin, Luke McMillin, Gus ‘Tavo’ Vildosola Jr., Bryce Menzies, Cameron Steele, Heidi Steele, Justin Morgan, Mark Samuels, Carlos ‘Apdaly’ Lopez, Jonathan Brenthel, Jordan Brenthel, Marc Burnett, Broc Dickerson, Wayne Matlock, Kristen Matlock and brothers Dustin and Parker Grabowski. SCORE expects some other ‘surprise’ SCORE Baja racing legends as well for the two autograph sessions. “With the support of and assistance from the Off-Road Expo and our sponsors, SCORE is honored to once again present the SCORE Baja 1000 exhibit at the Expo in a such a huge way to celebrate the 50th anniversary this year of the SCORE Baja 1000 and to continue introducing the next generation of racers and fans to the what the SCORE racing is all about,” said Roger Norman, SCORE CEO/President who himself is a former champion SCORE Trophy Truck racer and SCORE Baja 1000 champion. At 3 p.m. PT on Saturday, Sept. 29, SCORE will unveil the official course map for the 2018 SCORE Baja 1000, the 51st edition of the iconic Granddaddy of All Desert Races. Next on the broadcast airwaves for SCORE, the BFGoodrich Tires 50th SCORE Baja 500 race coverage show is scheduled to debut on the El Rey Network at 3 p.m. PT on Sunday, Sept. 9. El Rey Network is a 24-hour, English-language lifestyle network and is available in 45 million homes across the country through cable and OTT providers and via satellite on DirecTV Channel 341 and Dish Network Channel 253. For more information on how to watch El Rey visithttp://elreynetwork.com.